Oak Meadow is partnering with LetsHomeschoolHighschool.com for a month-long giveaway promotion with two terrific prizes! One grand prize winner will win a $100 coupon toward anything in the Oak Meadow Bookstore. High school students can choose from a broad array of comprehensive, interdisciplinary courses, with curriculum materials in English, Math, Science, Social Studies, Fine Arts, and Health & Physical Education. 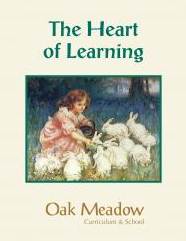 The second prize winner will receive one copy of the 35th anniversary edition of The Heart of Learning. Written by Oak Meadow founder Lawrence Williams, this book guides the home teacher toward a deeper understanding of child development, the learning process, mindful parenting, and how to create a rich learning environment in the home. To enter this giveaway, comment below and share why you would like to use Oak Meadow. You may earn up to four additional entries for this giveaway by sharing this giveaway on Facebook and coming back and commenting to let us know, by sharing this giveaway on Twitter and coming back and commenting to let us know (with your Twitter ID), by sharing this giveaway on your Google+ profile and coming back and commenting to let us know (with the URL link of your share), or by sharing the giveaway on your blog and commenting to let us know (with the URL of the blog post). Please note that each additional entry must be entered in a separate comment. Keep up with the latest at Oak Meadow!